Our stay in Dubai was for 1 week. The hotel is located near dubai creek and downtown (between). You can go easily to the beach La Mer (10-15 minutes). Everybody was very friendly and really professional.For any information they offered us their help. Special thanks to the sri lanlan "bellboy" (I personally do not like that term), who helped us with the luggage and was always smiling, asking us how we are and giving us information if we had question. The rooms were super clean. Everyday you get new towels, blankets, and your room will get cleaned up. You can use the gym and sauna as well. The food buffet was okay. Thank you Al Khoory team, hope to see you again next time! It was a very good stay.. home away from home kind of a feeling.. Guest Service is up to the mark. Loved the ambience of the hotel and connectivity was really good. Would like to specially thank Mr. Percy the security manager who is so extra ordinary with his duties and helped us in every possible way during our stay. Overall staff was really helpful and kind. I would like to stay here again for sure. The hotel is situated in a strategic location in Dubai at Al Satwa, a residential area in Dubai. The place is near La Mer Beach. Also just outside the hotel, you can already see Burj Khalifa. For a 3-star hotel, they gave an exceptional sevice. The staff are accommodating, rooms are clean as well as the whole hotel. The cleanliness and the totality of the place can pass as a 4-star. The place is better than some so-called 4-star or 5-star hotel we have been to. Kudos Al Khoory team! We just got back from Dubai ! All my wife and I can say is..... AMAZING ! We stayed at the Al Khoory Executive hotel. It was a very clean and modern hotel, of which, if we would visit again. We would stay here. The concierge "Ameesha" was truly a wonderful person. He would suggest areas to see and visit, and would always be there by the door meeting us when we came back from an excursion with that Big smile ! :-) Truly an asset to this hotel !!! Ameesha - keep smiling !!! An additional person we would like to give a shout out to, is Ritesh behind the check in desk. We had a few issues with our travel package and Ritesh found the correct number of the company. He called them, on our behalf, and was very stern with them regarding the issues we had them. This was very helpful and made my wife at ease! Again, another wonderful asset to the Hotel Al Khoory! We stayed for 5 days , the first 2 days in a suite and then in a room with balcony. We liked it both, the receptionists were nice and helpful, the breakfast was good, the sheets were clean and the bed was comfortable. What i did not like is that the room cleaning process was late, they cleaned our room at 3 pm, and the windows need a better cleaning. Overall, we enjoyed our stay and we ll do ut again. The staff of the hotel was ver nice, Ameesh and Ezhil served us great services, helped us with luggage service and even with the dinner service. Had a great time staying there. 👍 I would definitely visit same hotel again. Located 1.4 mi (2.3 km) from La Mer, Al Khoory Executive Hotel is within a 15-minute drive of other popular attractions like Dubai Mall. This 208-room, 3-star hotel welcomes guests with a restaurant, free in-room WiFi, and free self parking. Enjoy a bite to eat at SPICES, the hotel's onsite restaurant. Savor a meal from the comfort of your room with room service, or get a quick energy boost at the coffee shop/café. Buffet breakfast is offered for a fee each morning from 6:30 AM to 10:30 AM. An LCD TV comes with satellite channels, and guests can stay connected with free WiFi and wired Internet. The bathroom offers hair dryers, free toiletries, and slippers. Other standard amenities include a coffee maker, free newspapers, and free bottled water. 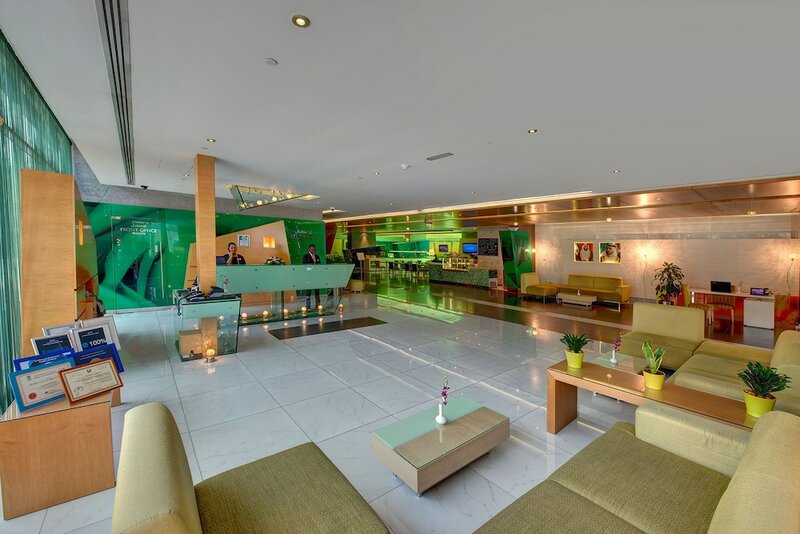 Al Khoory Executive Hotel offers a fitness center, a sauna, and free WiFi in public areas. If you plan to drive, free parking is available. The 24-hour front desk has multilingual staff ready to assist with dry cleaning/laundry and luggage storage. Additional amenities include a conference center, a 24-hour business center, and express check-in. SPICES - Restaurant specializing in international cuisine. Open daily for breakfast, lunch, and dinner. Recreation features at Al Khoory Executive Hotel include a sauna and a fitness center. The preferred airport is Dubai (DXB-Dubai Intl.). No alcohol is served or permitted at Al Khoory Executive Hotel.